Almost all brewpubs sell growlers these days, as do many breweries. And regardless of its true origin the growler is a great way to take home some fresh brew from a local brewery or brewpub. Growlers are filled straight from the tap, sealed with a twist-cap, and are sometimes labeled (source: beeradvocate.com). Popular in the craft beer industry, a 64 ounce growler is typically the ideal choice to transport draft beer from brewery to home. However, once opened, beer stored in growlers tends to go flat if not consumed in about a 12-hour period, similar to soda in a two-liter bottle. To solve this problem, beer enthusiast Robert Scott has designed the Growltap. 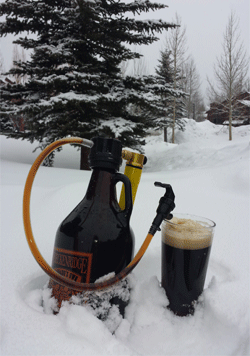 The Growltap essentially turns a growler into a mini keg. 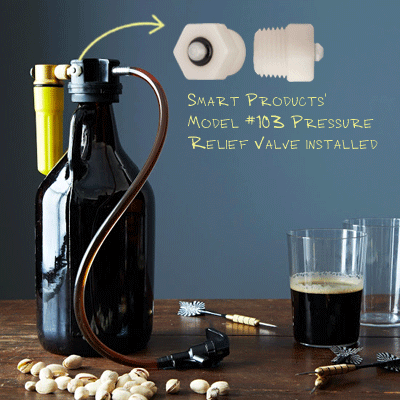 After the initial seal is broken on the growler, the Growltap attaches to the opening and consists of a beer faucet, CO2, and Smart Products' Model #103 Pressure Relief Valve. Once attached, the Model #103 ensures the internal pressure of the growler never exceeds 9 PSI. The Growltap allows the beer to stay fresh and carbonated longer. "The Smart Products pressure relief valve is integral to the success of our Growltap. It is reasonably priced and easy for our manufacturer to install. Because the valve is available at such a low PSI, it is an important safety mechanism for our product. And with our next order, we are looking forward to receiving it in the color yellow to match our CO2 dispenser. I also want to thank Joshua, Product & Application Specialist, and the team at Smart Products who have helped us in numerous ways, including testing and advising us about their products," says Robert Scott, President, Cromulent Conceptions, LLC. To learn more about the Growltap or to view a video of how it works, click here. Growltap photos taken by Photographer James Ransom. Available as a 1/8" Male NPT design, Model #103 is easily placed into plastic, metal, or other materials. Like all of our valves, Model #103 is customized to fit a unique design criteria by plastic body material, o-ring material, and spring pressure. Specifically, these models are available to be molded into Polypropylene, Nylon, Polycarbonate, and Ultem® with o-ring options in Buna-N, EPDM, Viton®, and Silicone, and Fluorosilicone. Opening pressures range from 0.09 to 20 PSI.